The Cream Filled Cakes are a Co-op favorite. So, I have been doing few different variations of them. These are Vanilla topped with Chocolate Ganache and are at the Co-op now. They also have Walnut Streusel Muffins, Cranberry Pumpkin Seed Granola Bars(Gluten Free) and Oatmeal Raisin Cookies. I borrowed the name from here. She absoutely loves the Lemon Custard in these. Lemon Cake, Lemon Custard and a light Lemon Buttercream. Yes, they are good. You could pick one up at Slight Indulgence. The Light Lemon Cream filled Cakes were such a hit at the co-op that I made more for them. They also are stocked up on Peanut Butter Cookies, Toasted Almond Muffins and the new Cranberry Pumpkin Seed Granola Bars which happen to be gluten, salt and peanut free. This is a photo of the Light Lemon Cream filled Cakes. If you like Lemon these are irresistible. You can pick one up at the co-op. Other goods are Coconut Date Granola Bars and Orange Chocolate Chip Scones. 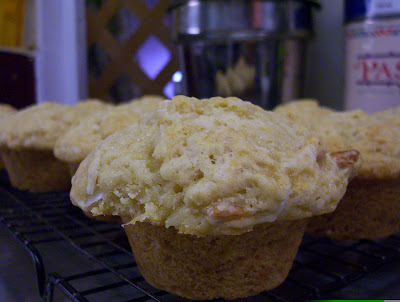 Pineapple Coconut Muffins are at the Co-opright now. Oatmeal Chocolate Chip Cookies and Irish Whiskey Cakes are also available. It took a few tries but these cakes turned out really great. A good bit of Irish whiskey taste, dusted with organic cocoa and topped with chocolate ganache. You can pick one up today at Slight Indulgence. What you see is the first batch of these muffins. The one in the photo was a little small so I decided to sample it. I like the subtle taste of the orange zest. Tasty but not overpowering. They are at the co-opuntil they sell out. Also at the Co-op are Chocolate Cherry Cookies, Peanut Chocolate Chip Granola Bars and Twinkies with a bit of Toasted Coconut on top. There are a few new goodies at the co-op.Cherry Coconut Muffins and Chocolate cakes covered in chocolate ganache with a raspberry treat hidden inside. Today I made these Vanilla Cakes covered with Chocolate Ganache. They were made for Slight Indulgence. You can stop by the Collins Ferry location to pick up a cake. Stop in the co-op for a fresh Toasted Almond Muffin, Chocolate Chip Cookie, Granola Bar or one of these Vanilla Cakes with Buttercream.